It is that time of year again where we go through all of the pictures we took throughout the year and create a year end photo montage to share with family and friends. At first this seemed like a simple idea that we did for others and didn't realize the power until we went back to watch the years gone by. We will be taking on a limited number of year end photo montages this season. Contact us if you are interested in reserving a spot to have a video production from your photos. Now the hard part begins, how to narrow them down. See more photo montages here. We just returned from Chris & Erin's wedding and it was beautiful as expected. They added a very personal touch to their wedding reception, their story. They shared their story through a video presentation. The story consisted of a Photo Montage (covering the growing-up and dating years), Love Story (which was a romantic piece about how they first met, proposed, and their hopes for the future), and Same Day Reflection (which was a highlight piece of their wedding day shown at their reception, edited on site by Amanda). The same day reflection truely demonstrated the power of video and its ability to connect you to the emotions and feelings from the day. Sit back and enjoy Chris and Erin's story just as the hundreds did at their wedding reception. Since this is not in true DVD form I had to include the screen prints of the DVD menu. A tribute to Christmas Past. Here is our 2005 Christmas Video. Here is our 2004 Christmas video. Wow how time flies. 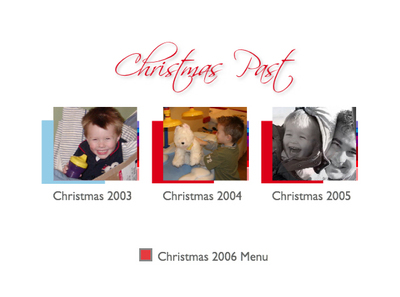 Our first Christmas video was in 2003. It it hard to believe that things change so much in a short amount of time. What a beautiful family! They make us look great. 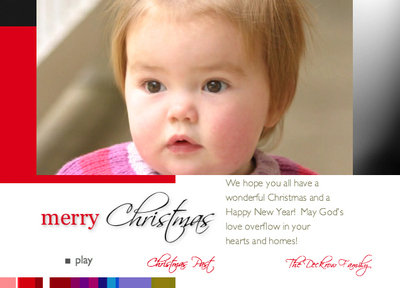 The Anthony's had their amazing photos created into a photo montage and sent them as Christmas cards. A great way to share your year with family and friends. The Maynards had an end of the year photo montage to capture their year and share it with family and friends for Christmas.